During the inaugural C.V. Starr & Co. Annual Lecture on China, panelists discuss the future of U.S.-China relations amidst ongoing trade frictions, tensions in the South China Sea, and political, demographic, and economic developments within China itself. HAASS: Well, good morning. Good morning. Welcome to the Council on Foreign Relations, and to the inaugural C.V. Starr & Company Annual Lecture on China. This annual series was established in honor of C.V. Starr—more formally, Cornelius Vander Starr, who founded the first American company in China 100 years ago. And it’s also a way to express my and our collective appreciation to C.V. Starr’s chairman and CEO, Hank Greenberg. And dedicating the Council’s first-ever annual lectureship on China to these two leaders is meant as a tribute to a century-long advancement of relations between the United States and China, and to their personal dedication to deepening understanding between these two countries. Hank needs little introduction here at the Council on Foreign Relations. He’s been one of our leading citizens and supporters for more than four decades. He served as a member of the Council’s board from 1992 to 2002. He was vice chair with—working closely with Pete Peterson from 1994 to 2002. And he continues to serve as an honorary board member. Today’s meeting will address the future of U.S.-China relations. Now, it’s a cliché at this point—but clichés often have more than a little bit of truth in them—it’s a cliché to say that this relationship is the most important bilateral relationship in the world, one that will help and shape and define the 21st century. But that’s all true. And while the United States still remains primus inter pares, China’s now the world’s second-largest economy and is increasingly asserting itself in other spheres. Let me say one or two things about how we got to this point. As you will all recall, after World War II the United States backed the nationalists against Mao’s Communists. And even after the end of the of the Chinese civil war, the U.S. maintained formal diplomatic ties with the nationalist-led Republic of China. Several years later, U.S.—American and Chinese soldiers fought one another in Korea when U.S. forces marched up to the Yalu River in an effort to reunify the country following the successful liberation of the South. Some two decades later, in 1972, though, President Nixon visited China and he ushered in a new second era of U.S.-Chinese relations, one that was premised on the old adage that the enemy of my enemy turns sometimes into a friend, in this case the United States and China had the Soviet Union as a common adversary. And the United States, by the end of the ’70s, under the Carter administration, showing that this was a bipartisan effort, formally recognized the People’s Republic of China and broke off formal relations with Taiwan, downgrading them to unofficial status. With the end of the Cold War, though, the anti-Soviet rationale had run its course, and a third justification evolved for U.S.-Chinese relations. And that was largely based, more than anything else, on economics, and the hopes that further engagement with China would lead to further opening of China, both economically and politically. But as virtually everyone we’re going to hear from—not virtually—as everyone on the panel has written about today, or spoken about, those hopes have not been entirely fulfilled, to say the least. And actually, the—I think we’re meeting a time where the center of gravity in U.S.-Chinese relations and U.S. perceptions of China has shifted markedly. I’d actually say I’m hard-pressed to think of another consensus in American foreign policy that’s moved as far and as fast as the U.S. consensus on China. And there’s a degree of disillusionment in the United States about China in the foreign policy establishment, shall we say, that is wide and deep. Much of it’s to do with the economic side of the relationship. People have grown weary of Chinese trade practices, of technology theft. But it’s also a reflection of what’s going inside China—what, with the treatment of the Uighurs, the abolition of terms—term limits by the president. And it’s also because of strategic concerns such as the South China Sea and what China has done there. As I say, we see it across party divides. You see it in our magazine. Indeed, you know, one of the speakers today is Ely Ratner. One of the first pieces that I though sounded the alarm or the message that things were changing on U.S.-Chinese relations was a piece that Ely and Kurt Campbell did some time ago. And then last October we saw it most, perhaps, pronounced in a speech the vice president of the United States gave at the Hudson Institute. So what we are clearly in is a fourth era of U.S.-Chinese relations. What’s not at all clear is what is the character of this fourth era of U.S.-Chinese relations. And where we go in the U.S.-Chinese relationship I think is one of the big question marks facing U.S. foreign policy and facing the world. And also—and here I turn to Liz Economy—also, in many ways, less settled is what’s going to happen within China itself. And you know, as a lot of people tend to extend into the future what they know from the past, the only thing I’d probably make a heavy bet on is that the future will not replicate the past when it comes to—when it comes to China. So, again, the first inaugural lecture—I guess that’s redundant isn’t it? (Laughter.) Either the first lecture or the inaugural lecture in this—named after C.V. Starr and Company, really couldn’t come at a better time given the bilateral relationship and given the possibility of outcomes in China itself. 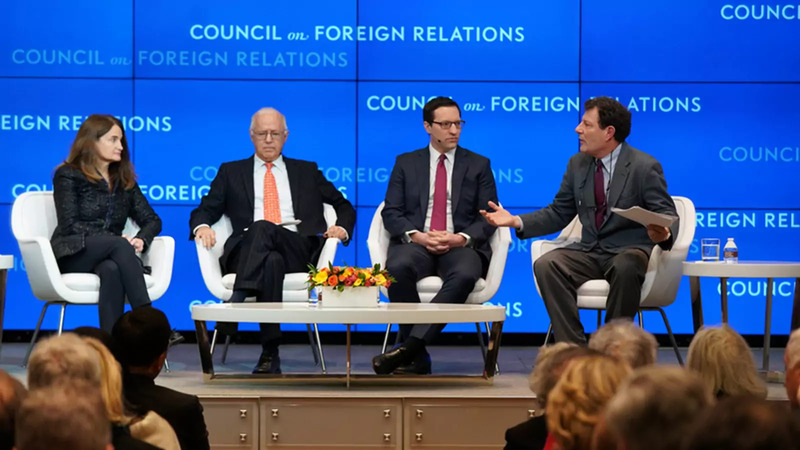 KRISTOF: Thank you all for coming to the Council on Foreign Relations inaugural C.V. Starr and Company lecture on China. Let me introduce our terrific panel. From your left, we have Elizabeth Economy, who is the C.V. Starr senior fellow here at the Council, and also the director of Asia studies here. We have Steve Orlins, the president on the National Committee on U.S.-China Relations. And Ely Ratner, the executive vice president of the Center for a New American Security in Washington. Let me start. Richard promised that we would explore the future of U.S.-China relations. But let me start by looking at how we got here, and how we ended up with this disillusionment that Richard alluded to with this new fourth phase. And, Liz, let me ask you that. How is it that we came to this new consensus that there is so much trouble in this relationship? ECONOMY: Well, thanks, Nick. And thanks, everybody, for coming this morning. It’s great to be here in honor of C.V. Starr and, of course, Hank Greenberg’s leadership of the company as well. So let me take my lead from someone that I think many of you know, Wang Jisi, who is one of China’s most renowned scholars of U.S.-China relations. And in an interview not too long ago, he said that the reason that U.S. policy has changed toward China is because China’s policy has changed. And I saw him maybe three weeks ago in Beijing. And I said, I hope you don’t mind, I’ve been quoting you on this. (Laughs.) He goes, no. He said, I want you to. And please send me all the articles that you’re writing to quote me. (Laughter.) So I feel very comfortable in quoting him here on the record. And I think the point that he’s making is that Xi Jinping really has upended our understanding of sort of the Deng thirty years of reform and opening up and has created a new model of Chinese politics both at home and in terms of Chinese foreign policy that really has necessitated a rethink and a reset in U.S. policy. So I think that, you know, a good half of it—responsibility rests with both countries for where we’re at, but I do think there’s been a fundamental shift in the way that China is conducting itself at home and abroad, both in terms of it being much more repressive at home. You know, and some of the initiatives very directly affect the United States, enhancing the role of party committees in multinationals and in—you know, in joint ventures and in private enterprises in China. The new law on the management of foreign NGOs, which restricts the opportunity for foreign NGOs, including U.S. NGOs, to, you know, be active in China, to partner with their Chinese counterparts. So some of these things are very direct. But also the much more ambitious foreign policy, right? And so I think there’s that element of it. And then, of course, there’s the Trump administration. And I think here you have a president who came into office—focused really on two issues—bilateral trade deficit and North Korea. But has felt for a long time that the U.S. has been disadvantaged in the relationship, certainly on trade. That somehow China has been cheating the U.S. for all these years. But beyond that, I think you’ve got a foreign policy bureaucracy in this administration that is probably the toughest on China that I’ve seen across the board—you know, through the NSC, Defense, et cetera—and a Congress that’s also. I think as Richard was suggesting the center is kind of gone—the moderate center is gone. And you have a bipartisan consensus around this idea that engagement hasn’t worked very well. And we can have a debate over whether it’s failed, because I don’t agree that it’s failed and so I’d love to talk about that a little bit later, but certainly it hasn’t achieved the, you know, sort of big objective that we had hoped in terms of China becoming a, you know, supporter of the liberal world order, and a moderate domestic policy. KRISTOF: Liz, do you see part of the problem as—maybe not China as such, but as Xi Jinping particularly? Is that kind of the nub of it? ECONOMY: For me, certainly. I think leaders matter a lot. And you may recall Wen Jiabao—the Hu Jintao/Wen Jiabao era—Wen Jiabao did a set of interviews in China and then also on Fareed Zakaria’s show, where he talked about the necessity of political reform, and the winds of change, and how the Chinese people needed free speech, they needed change. It was a very different China in the 2011-2012, before Xi Jinping came into power. Some of the things were already in motion, but really there was much greater openness. Civil society was flourishing. The internet was a very vibrant political space. He really has been transformative. KRISTOF: Ely, let me ask you the same question, but with sort of a twist. There is not only a disillusionment toward China now, but there’s also, I think, a deep anxiety that China is eating our lunch, and that on issues from automation to the South China Sea, that the future does not bode well for the competition between us. And that that may feed into some of the concerns that we have. So you’ve written about this issue. Is that part of what is driving the problems between our countries? And is there anything we can do about that? RATNER: Sure. Yeah, no, thanks, Nick. And it’s great to be here as well. I guess what I would say to that question is, you know, if the old China debate in Washington was what’s the right mix of engagement and balance and what’s the right hedging strategy to try to integrate China into the liberal international order, as Liz has described and we’re seeing that that’s not really coming about, I think the question is where are the new debates? Where are the new cleavages on China’s strategy discussions within Washington and nationally? And I would describe them sort of in three questions, to get very quickly to your question. The first is, how quickly is China’s power and influence expanding around the world, right? Is it edging out, or is it moving very quickly, and we should be concerned about what’s happening in Africa, and Latin America, et cetera? So how quickly is it moving? Second, how illiberal is it? How illiberal is Chinese power and influence around the world? Is it the fact that, as some may argue, that they’re largely upholding the international system, and they sort of want what we want, maybe a little different, they just want a seat at the table? Or is what they’re doing more transformative to really undermine what we perceive as economic and political liberalism around the world? And, third, what are the constraints on that power? There are people who argue, don’t worry about it so much because, first of all, there are other countries, like Japan and India, in the world who are constraining Chinese power. Second of all, China has all these internal domestic problems that will constrain their ability to really express power internationally. So I think how you line up on those questions is where you’re going to come down on today’s debate. For me personally, I see China’s influence as expanding fairly rapidly. I see it as fairly illiberal. And I don’t think these kind of domestic and international constraints—while it will be two steps forward one step back for China, I ultimately don’t think it means it’s going to constrain them to be sort of a middle power in Asia. KRISTOF: And, to be clear, you think that there is this strategic competition between us, and that China is presently winning that competition, correct? RATNER: Yeah, I think if you look at the vectors of competition, at the—at the military competition, the technological competition, the diplomatic competition, the economic competition—I think on average what you see is American advantage narrowing primarily because of a lack of an effective comprehensive strategy from the United States. KRISTOF: Steve, you’ve been following U.S.-China relations since way back when—when I think, in the—as a young lawyer in the State Department I think you helped—you helped establish diplomatic relations. KRISTOF: And you—I remember meeting you in the 1980s and in Hong Kong. From that perspective of watching relations wax and wane, I think that you have a—I think you think that the present disillusionment is overdrawn. Can you talk a little bit about your take on this? It’s always good when we have panels that disagree, so a little bit of—a little disagreement will be welcome. ORLINS: The failing one. The failing one, which says: Trump’s claims were misleading, exaggerated, or false. Now, of course, it was referring to the border wall. It could have been referring to kind of what they’re talking about on China, that what we’re seeing is a serious of false, exaggerating, and misleading claims. Liz mentioned the bilateral trade deficit. I mean, really? The bilateral trade deficit is an important part of U.S.-China relations? Is there any serious economist who believes that that should be a metric of trade? What we once had during the W Bush and the Obama administration was a metric which was current account surplus to GDP, which most serious economists would believe is a way to measure trade practices. It’s gone from 10 percent to 1 percent, and it’s heading towards zero. That would be a more realistic way. But we don’t—we don’t talk about that. Intellectual property theft, is it a problem? Of course it’s a problem. Should we do everything in our power to stop that intellectual property theft? Yes. But does anybody bother to point out that Chinese payments of royalties have increased from 10 billion (dollars) ten years ago to 30 billion (dollars) now? It’s a whole series of things that are just grossly exaggerated. So we’re painting—what we’re doing, in effect, is we’re demonizing China. And the problem with it—and this is where we get to the disagreement I think I have with Ely, is that by branding China a strategic competitor—I don’t disagree that it’s an economic competitor and a diplomatic competitor. But when we brand them a strategic competitor, when we have a National Defense Strategy which says: We need to spend what it takes to defeat and deter this, quote, “revisionist” power—I can talk about the absurdity of branding China a revisionist power here—that diverts spending from what we really need to compete with China to the strategic side. It rewards what President Eisenhower would call the military-industrial complex for this and punishes social programs, education, infrastructure investment. So what we’re seeing is an exaggeration which has terrible policy consequences for America. KRISTOF: But, Steve, so there is, I think, generally something of a consensus that we had policies that tried to turn China into what the Bush administration called a responsible stakeholder in the international system, and they abused the instruments that we use—have used the, the Chinese relationship, for their economic and strategic reasons, and that that is part of what is driving this sourness, along with human rights. Do you contest that? ORLINS: Liz—in other words, part of the reason, exactly what Liz was talking about—that part of the reason we’re not seeing the pushback is that Chinese policies have systematically alienated all of the constituencies which used to be pro-constructive engagement. The business community is sick and tired of the promises which are empty. The academic community is tired of potential impingements on academic freedom. The NGO community has seen an NGO law which has been terrible for NGOs in China. So the constituencies which used to be pro-constructive engagement have become alienated. And they’re not standing up to these exaggerations and misstatements. And what’s so interesting is media—including your paper—have questioned the administration’s policy in climate change, on immigration, on environmental protection, on Iran—you name it. They’ve questioned it. But a lot of these misstatements about China go unchallenged. Are there truth in them? Absolutely. Are the exaggerations and misstatements and lead to bad policies for America? Yes. ECONOMY: So, Steve, I just want to get a sense here for whether or not you’re saying that it’s bad to call China a strategic competitor because that puts them in some kind of bucket that then has a set of policy implications, ramifications that are not good, but in reality they are a strategic competitor because if—I mean, putting aside the focus on bilateral trade deficit—which is—it is a significant number and, right, nobody agrees with it except for the president as a metric for understanding the relationship. But I think most people would agree that China hasn’t undertaken the necessary structural reforms that either, A, were anticipated or, B, created a level playing field for U.S. and other multinationals, right? So that’s true. We know that China is in fact out through the Belt and Road and other mechanisms spreading illiberal political things. You know, it’s exporting its surveillance system to sixteen countries. It’s out there training officials on how to manage the internet and dissent and et cetera in thirty-six countries. I mean, it is out there in significant fashion sort of remaking, you know, part of the global landscape. And then there’s the security element as well. So to me, it seems as though they are putting themselves out there, and Xi Jinping has said as an alternative model, as an alternative example for countries that want to reject the U.S. sort of model—they’re putting themselves out there. So across the board, it seems to me, they are a strategic competitor. The only question is, does it make sense to brand them as such. And one other small point, I guess on the issue of the royalties it’s good to hear they’re paying 30 billion (dollars) in royalties, but the findings from the 301 investigation suggest that intellectual property theft is costing 50 billion (dollars) annually from China. So, you know—(laughs)—there’s a lot of room for improvement there still. ORLINS: Oh, there’s no question there’s a lot of room for improvement. But as it does on the border wall, immigration, that these numbers are all exaggerated. ORLINS: When you go and you look at—when you look at the footnotes of these reports you kind of go, huh, well, there’s not—there’s not that much here. Should we have policies which seek to stop hacking, which seek to stop intellectual property rights theft? Absolutely. But should—in either case, China shouldn’t be considered a strategic competitor. Even if they are, it doesn’t help us. But in fact, I believe they’re not a strategic competitor, that in truth Americans care about, what? What do Americans really worry about? They worry about climate change, as we’re now seeing in the Democratic Party. They worry about terrorism, as we experienced here. They worry about pandemics. These issues, which Americans really worry about, are things which we will cooperate with China to confront. That—you know, Ely and I have talked much about the South China Sea. Is that really an existential strategic threat to the United States? I would argue no. Has China violated international law in its actions in the South China Sea? Yes. But does it mean it’s a strategic threat to the United States? I would argue no. I would argue cooperation on North Korea is more important and more existential for the United States than what’s going on in the South China Sea. KRISTOF: Ely, you wanted to jump in. RATNER: Just a couple reactions. I mean, one, I think it’s incredibly important to differentiate between the Trump administration’s China policy and the argument of whether we need a more competitive approach toward China or not. And I think those things get fused sometimes in a very unhelpful way, where when people are criticizing a more competitive strategy they start going after what are obviously some of the shortcomings of the Trump administration. So those things need to be separated. I think on the—just a couple things on the use of the word “strategic.” When I—when I use that word, what I’m thinking about is a comprehensive challenge about—with the concerns about what a China-led order may look like in Asia and beyond. It doesn’t mean just a military fight. And in fact, the military dimensions of the competition, I think, in many ways are the least important in terms of where the competition is really going to occur over the next decade, even for folks like myself who support a more competitive strategy. And in fact, if you look at the Trump administration’s National Defense Strategy, what it says explicitly is the United States needs a strategy for military competition in Asia beyond an era of primacy. So they’re not calling for a return of American preponderance. What they want to do is reinforce deterrence because the U.S. military right now is designed to fight wars like we fought in the Middle East, which are not suited to deter China. And I think there are concerns that the lack of American deterrent could lead to instability over Taiwan or otherwise. So I think that’s much more of a defensive deterrent part of the strategy. I don’t think we’re likely to trip into a war. And to steal a line from Richard Haass here, I think the—you know, this competition does begin at home. What I like to say, American—the U.S.-China competition is about us. It’s about American competitiveness. It’s no longer about changing China. That’s what the old policy was about. This is about getting our own economics, our own technological, and innovation, and social system, and immigration in place to be our best selves. So I think there’s a big difference between talking about a competitive strategy in sort of a militant, confrontational strategy, versus one that’s seeking to make American strong again. ORLINS: And the increase of the Defense budget to 700 billion (dollars)? Part of it justified based upon confronting China? Is that good for America? Does that make us strong? Does that rebuild our educational system? Does that rebuild our infrastructure? RATNER: Well, the reformists—the reformists who are looking to transform the U.S. military would say we can do it wrong at 750 billion (dollars). We can do it right at 650 billion (dollars). And in fact, the changes that we need to make to be able to deter China in the future are actually going to have to tear apart that military-industry complex that you’re talking about. Those are the most resistant in the services and in industry to the types of reforms we’re going to need. So I don’t think that’s the engine that’s driving the kind of military reforms that we need here in America. KRISTOF: Steve made the point that President Trump’s analysis of China has often been, you know, wildly exaggerated and sometimes misfocused. But I must say that my take is that even with a different president there would still be, you know, very similar strains. And I’m struck that I got my first journalist visa to China in 1987. And I can’t get a journalist visa that is useful now because I essentially have to list everybody I would ever speak to and state every place I would go to. And it’s kind of meaningless. And it reflects a real step backwards since 1987. And so I wonder to what extent we—I sort of alluded to this with Liz earlier—that the problems reflect two—well, a rising power, confronting a traditional power, and those inevitable structural conflicts that arise. And to what extent a lot of this is really about Xi Jinping on the security sphere, in the human rights sphere—a million people detained in Xinjiang, and his aspirations with the Belt and Road initiative. You know, is he at the core of this? ECONOMY: So, I think we often do ourselves and our understanding of China a disservice by framing everything as this U.S.-China, you know, bilateral competition or the Thucydides trap, or however you want to put it, because when you look around the world you find out that many other countries are facing similar challenges and adopting similar policy responses in terms of their relationship with China. So whether you’re talking about European countries looking at revising some of their investment laws—I mean, if you—one of the things that I think is so striking about this administration is if you put aside the president and you look at what the foreign policy bureaucracy is doing, it’s far more multilateral in its orientation than it’s often given credit for. I mean, it really is out there working very hard to establish relationships and partnerships with countries in Asia, and in Europe, and beyond, across the board. I mean, secretary—Ambassador Lighthizer, you know, has stood two years in a row with the Japanese trade representative, the EU trade representative, saying the exact same things about Chinese, you know, trade practices. You have on the human rights front, the Europeans standing with the United States at the U.N. on the Xinjiang issue. I think if you look to some extent across the board you will find—Europeans and others are not happy with the way that the U.S. has approached China, on the tariffs for example. But fundamentally, in terms of their values, what they’re concerned about in terms of the rise of China, they tend to line up very closely together. So I think it’s important to recognize that a lot of this is about China’s policies, as opposed to just the United States and China, and the U.S. trying to prevent the rise of a competitive power. KRISTOF: I’d like to take us through a couple of specific areas. And trade may be the start. Trade is in the headlines, obviously. My sense is there is some belief that we may be able to resolve this particular trade crisis—perhaps after an initial delay—but that the larger, structural problems are going to remain a major source of disagreement. Is that—would you largely see it along those lines? Anybody want to contest that? ORLINS: Yeah, I mean, I think it’s correct. What we’ll see, I assume, is we’ll see some reduction in the bilateral trade deficit through an agreement on soybeans, corn, energy and other things, which will increase U.S. exports. The structural issues will be deferred. The interesting part to me about the structural issues is China has a solution already. China has already announced the solution of the structural issues. It just hasn’t implemented it. Now, in the five years—now five and a half years ago, in the third plenum of the 18th Party Congress, they proposed structural reform that, if it had been implemented, a lot of the structural issues between the United States and China wouldn’t exist. So the question is, when is Xi Jinping going to understand that this is not only good for U.S.-China relations, this is good for China? That the policies which China adopts now are ones which as an investor I used to love. They were incumbent protection. I loved monopolies, as an investor. It was great. I made more money. I didn’t have to have work as hard. It was terrific. It ain’t great for the consumer. It ain’t great for the customer. And what’s going on is the restrictions on foreign investment and the support of state-owned enterprises versus private enterprises in China is just incumbent protection. It’s just continuing to support the state sector. China’s slowing economic growth now is not based upon the trade war. It’s based upon, for the first time in forty years, bad economic policy. That supporting the state sector and not supporting the private sector is slowing economic growth. The Chinese economic miracle is based upon private enterprise, not state-owned enterprise. And what they’re doing now is supporting state-owned enterprise. The credit allocation—if you look at it—I kind of said, gosh, I guess they missed Ec 101. They didn’t get it. Because this is not good policy for China and its economic growth. At some point—again, forty-something years of dealing with the leadership—these are well-trained people. They really are well-prepared for their jobs. Getting the data that they’re getting now, I think they’re going to swing back to supporting the private sector. RATNER: I think one would hope so. And there’s certainly folks inside of the leadership who are making those arguments. I think the problem is that the experience over the last year has only reinforced, as far as I understand it, the views of Xi Jinping and others on the importance on the need for protection, and indigenous innovation, and state support for the areas, like technology, that are at the heart of the competition. So the lesson for Xi Jinping, as far as I understand it over the last year, is not: This isn’t working, we need to open up. But rather, see I told you that our interdependence with the United States was a vulnerability and we need to defend against that. So I think that’s one of the reasons why while we will see some elements to a deal, some opening of some sectors, I think the areas that are at the core of the competition are unlikely to be resolved in the short-term. KRISTOF: And presumably at a time of a slowing economy in China, it’s harder to muster the political capital to introduce the kind of liberalization that would be in the interest of the Chinese people. ECONOMY: I think if Xi Jinping wanted to introduce liberalization in the Chinese economy, he could do it. He’s managed to do, you know, all sorts of things that he’s put his mind to—even made some progress, although it’s stepping back now, on the environmental front. I mean, if he can take care of what’s going on in Xinjiang, he could liberalize the economy. I think what a lot of people miss is you look back to that third plenary of the 18th Party Congress at the—at the program that came out afterward, and it was about market reform, right, making the market a decisive force. But it also talked about retaining the role of the state, you know, in command of the economy. So that duality was present even in that third plenum sort of document. And a far as I can tell, Xi Jinping is all about control. I mean, if you look at his policies across the full spectrum—whether we’re talking about the Chinese economy or the Chinese political system—he is very reluctant to take his hands off of the levers of control. I think, you know, Xi Jinping himself is the biggest vested interest when it comes to the Chinese economy. So I’m not optimistic. I think there are plenty of economic reformers that have been making this place for the past six years. They had a big brouhaha in the fall, those economic reformers, a big conference, where they’re saying, you know our economy is sinking. We have to push forward with structural reform. We know Liu He is very oriented in this regard. And yet, they—you know, he is not willing, I think, to take that risk of loosening his control over the economy. KRISTOF: Let me ask a little about the security sphere. ORLINS: But, Nick, you should—I think there’s an interesting analogy, because when you—you know, when you and I were in China around June 4, 1989, and then the subsequent period of really economic stagnation and nobody believed that we would see reform at that point, and then Deng made his trip down south and sort of reopened the reform. I agree, Xi Jinping is a different person, but these numbers are bad. You know, the growth number is saying it’s 6.2 percent, it’s 6.5 percent. It’s not. You know, I have lots of friends who run lots of businesses. And they’re no talking about slowing growth. They’re talking about contraction—friends in the automotive parts business, who are selling less—they sold less in 2018 than they sold in 2017. It wasn’t a decrease in growth, it was actually contraction. When the leadership sees that, they’re going to—they’re going to get increasingly nervous. And I think they’re going to change. ECONOMY: OK. I hope you’re right. Let me ask about the security sphere. And, Ely, this is something you’ve explored a lot. Should be concerned about the South China Sea, the East China Sea, and about some security incident spiraling out of control? RATNER: So I think the question is what should we be concerned about? I have tended to believe that these analogies to World War I or Thucydides are not the right lens through which to view the U.S.-China competition. I think the likelihood of a small incident or crisis spiraling into World War III is quite low. So I’ll put that on the record, saying that. We’ll see. I am much more worried about a creeping Chinese sphere of influence, often in what military strategists call gray-zone tactics—nibbling away below the threshold of military activity, which they’ve done in the South China Sea, which could result in the development of a—of Chinese sphere of influence, which could have a whole set of knock-on effects into the economic sphere, and the political sphere. So I’m more worried about that set of trends versus a very near-term military clash. I think we have fairly good communications with the Chinese military. Some of it’s institutionalized. And the incentives for military conflict at this point are extremely low. And to my earlier point, if the U.S. gets its defense strategy right, I think it will stay that way. KRISTOF: Steve mentioned earlier the opportunities for working together on issues of—that we all care about—climate, many others. I’m curious as to what each of you thinks are some key areas where we could actually try to cooperate, work together, for the benefit of both countries and, indeed, the world, and maybe try to rebuild a little better trust. ECONOMY: So I think it’s really important that we find some areas of cooperation. I think we have other parts of our strategy, you know, coming into place, in some ways, that are not actually that bad. But that cooperative element is largely absent with this administration. So what are some of the areas? I think we are supposed to be working with China still in Africa on the developing a CDC in Africa. I think that’s an important initiative. In terms of climate change, it’s harder, obviously, since at the federal level we are not really proactive in this area. But certainly California and China have strong cooperative efforts underway. You know, more states in the middle—in the Midwest are coming onboard to climate change and talking about trying to live up to the Paris accords. So I think there may be some bottom-up efforts on that front. I think the sort of areas I would look to in the future might be, you know, norms and governance norms around artificial intelligence. That is something that the Chinese themselves are talking about. They’re very interested in moving forward. And again when I was there a few weeks ago for the security conference, the person who was running it was talking about having a working group with the United States, and China, and other countries to start talking about this as an area. And given Chinese rapid advances, I think it’s an area where I think they’re going to have some advantage. They’re going to want to try to set the norms themselves. And so I think we ought to be working with them in that area. And then maybe development finance, right? So the Belt and Road initiative we know, right, that the way they’re going about doing business is causing a lot of problems for them. And there are a lot of complaints within China about the Belt and Road initiative, not just in some of the countries where they’re undertaking a lot of these projects—the infrastructure projects. So I think, you know, working with China, having some kind of large, you know, sort of institutional effort to bring their standards up on environment, on transparency, on the labor issues, I think would all be to the good. But I don’t see much of a sentiment right now in Washington for thinking in those terms. I think people largely think it’s kind of a waste of time. They’re in some ways small-bore issues. (Laughs.) Maybe North Korea is the area where we feel like we have the greatest area for cooperation. RATNER: Well, I think and part of the reason for that—I think that’s right—part of the reason for that is that there’s a view, I think probably correct, that the pursuit of some of those cooperative initiative came at the expense of thinking hard enough about the competitive aspect. So at least during the Obama administration and prior to that in areas where China was acting outside the bounds of international norms or contrary to U.S. interests, whether in the South China Sea or elsewhere, the view was, well, we have to focus on these cooperative efforts—whether climate change of the Iran nuclear deal, so we can’t deal with those other problems. So maybe we’ve over-torqued to the other side, but the trick is going to be getting the balance right, finding those areas of cooperation, even as we’re entering a more competitive period. ORLINS: We need to establish rules of the road with respect to cyber. Not with respect to espionage, but with respect to kind of businesses that need to operate. That the Bank of China and Citibank, that Facebook and Baidu have the same interests. And we need to establish rules on both sides that allow these companies to operate. ECONOMY: You mean internet governance. ORLINS: Internet governance. You know, and, you know, Ely is right, that people are not willing to—in the administration—are not willing to focus on the cooperative aspects, because they feel that we sacrificed the competitive aspects when we overly focused on the cooperative aspects. ECONOMY: I will say, this is a time when I think the Chinese might consider stepping up to the plate. I mean, I think if you look over the history of U.S.-China cooperation, probably—I mean, you can correct me, Steve—but I would say 95 percent of the initiatives have come from the United States, not from China. You know, given our current administration, it would be so interesting, right, if Xi Jinping and the Chinese leadership would step up to the plate and say: We would like to propose a major new initiative on resolving the problem of refugees in the world, or something like that. But they’ve been strangely silent, but all that Xi Jinping talks about, you know, his leadership on the global stage, et cetera. ORLINS: Well, they’ve moved forward on RCEP to some degree. In other words, the TTIP—the Trans-Pacific Partnership Chinese version was something called RCEP. And they’ve kind of stepped—as we’ve withdrawn from the TPP, they’ve stepped up to that. What Ely suggests in his testimony, which I completely agree with, is we should reevaluate TPP and think about is this something that we should do again, we should participate with some revisions? I think the answer to that is absolutely yes, that if we create a Trans-Pacific Partnership, what we do is we basically set a bar for China in the trade and investment area, which ultimately the reformers in China can say: This is what we need to work towards or we’re going to be excluded from intra-Asia and trans-Pacific trade. So it would be a terrific thing for the United States to do to cement our alliances by moving again towards TPP. But, as I think Nick said, neither presidential candidate was willing to commit to that—neither Secretary Clinton nor President Trump. RATNER: And I think there’s no—I would just say, there’s just one point I wanted to make earlier. I think there is—I think there is opportunity to land eventually in a strategy that everyone on this stage would be comfortable with in terms of U.S. policy, because as much as we’re talking about a new consensus, I think we have a consensus on what didn’t work before. But there isn’t a new consensus on the way forward. In fact, there isn’t even a new consensus on what the problem is. And I think what we are saying, at least what I say day-to-day in Washington, engaging Republicans, Democrats on the Hill, interest groups, is there’s a large umbrella of people who are coming in, but they’re docking in on different issues. They’re docking in on Xinjiang and human rights and rule of law, they’re docking in on the security issues, they’re docking in on the economic issues, manufacturing, or the technological issues, And they’re comfortably sitting under that. But there’s no consensus story about what’s the problem here and how are we going to deal with it? And so I think there’s a lot of rethinking that needs to be done, but also opportunities to find some of these areas of cooperation. I wouldn’t want to folks to walk away today thinking that there’s a very consolidated view in Washington right now, that we’re full-bore ahead with any particular type of strategy. I think all of this is up for grabs right now. KRISTOF: I want to go to questions in just a moment. Let me ask one last question of you before I yield to member questions. You know, I’ve been at Council events on China since I think 1988 or ’89. And it used to be that they were very kind of enthusiastic, and the cup was always half-full. And the narrative has changed, you know, here and across the country. And I do—I do worry a little bit that, you know, even—I mean, I’m part of this souring. But the upshot is that I’m less willing to challenge sort of hostile exaggerations about China. I think people across the board are, in the business community and elsewhere. And I worry a little bit that China is this incredibly complicated country with things going in every which direction, and that a narrative is seizing hold that doesn’t fully account for that complexity. And that just as we overdid things—we over-torqued, in your words, Ely, before in one direction, that we may not appreciate that nuance today. Is that—is that a legitimate concern? Steve, I’m sure you think that’s a legitimate concern. Liz? ECONOMY: Well, I mean, it’s—of course, what you’re saying is just smart, right, and sensible. And what it speaks to is that we need to keep going there, right, and taking stock all the time of what’s changing on the ground to understand the different forces at play, and how those might play out in the international stage. So I think, absolutely. But I also think that actually the assessment right now, at this moment, is not, frankly, that exaggerated, that overblown. It may miss some of the nuance, but there is no—you know, there’s no saying that it’s not the case, for example, that after the passage of the law on the foreign—on the management of foreign NGOs, that the number of foreign NGOs did not drop, from over seven thousand to about four-hundred-something. The numbers, right? There are facts on the ground. And that’s what we should be dealing with. ECONOMY: Yeah, alternative sources of facts. I get all—you know what I mean, though. You can present royalty figures, and I can present IP theft figures, right, and then that—then somehow we have to deal with the advantages that come from doing business with China as opposed to some of the challenges. But just because there are those advantages, doesn’t mean that we don’t have to deal with those challenges. So I say, you know, go to China. You know, seek truth from facts on the ground. And then respond accordingly. RATNER: You know, it depends, of course, what you do with that finding that we’re facing this big challenge. If it is to say, well, we’re going to ban immigration, and we’re not to not let any students into the country, and we’re going to have an $800 billion defense budget focused on preemptive strike, then that’s a problem. If you answer is, well, we need to set high-standard trade and investment rules, we need a strategic immigration and visa policy, we need to double down on education, et cetera, et cetera, then that’s a different direction. KRISTOFF: So I’d like to invite questions. Please wait for the mic. Please make it question and not an assertion. And identify—please identify yourself and your affiliation. And just a reminder that this is on the record. Q: Minky Worden from Human Rights Watch. Nick, to your point about the pessimism, I do think that if you work with ordinary Chinese people, with journalists, with workers, with feminists, you get a different perspective on the future, and especially with the younger generation. Thirty years ago this June marked the Tiananmen Square crackdown and an authoritarian trend that has shaped China, that you have described this morning. And I think it would be accurate to say that Xi Jinping’s change of policy is actually remaking the Tiananmen repression across a number of areas. One of the areas that U.S. policy—both Democrats and Republicans—have embraced, is the support of ordinary Chinese citizens. In this 30th anniversary year, could Washington back ordinary Chinese people? And if so, how? ECONOMY: Well, that’s an interesting question, Minky. Ordinary Chinese people. I mean, I think there are a couple of different strategies. I mean, one would be, you know, working through organizations like the Asia Foundation, right, or the National Committee on U.S.-China Relations, or others to support the continued development of civil society, right? So even though it has become more difficult, some nongovernmental organizations continue to—or, have become registered under the new law, and are doing work on things like women’s empowerment, right, which speaks to the feminist issue. I mean, it’s certainly tougher to do rule of law programs. It’s certainly tough, certainly, to do labor organization. I think calling China out is always important when it is—when there are bad actions going on in places like Xinjiang. I mean, there are other actions we can take, but you’re talking about ordinary Chinese. I mean, to that point, I think probably the most important thing is to remain engaged with China, and not completely, you know, wall ourselves off. And obviously, as Ely was saying, to continue to welcome Chinese students. I will say it is interesting—and I don’t know whether you’ve had this experience as well—that a number of Chinese who’ve come to visit have talked about the Trump administration as actually being very helpful, and the pushback from—the tough line that the Trump administration—that this is the one thing that they believe is keeping Xi Jinping from his worst excesses, which the first time I heard it was surprising, but probably the third time I heard it I began to think that this is a narrative, certainly among Chinese intellectuals, that that pushback is important, because that in some way is constraining Xi. And then, I guess, you know, could we begin to think about, you know, things around surveillance technologies and the provision of other sorts of, you know, equipment that enable these things? That takes us down a different path. But I suppose all those things are on the table. KRISTOF: Certainly what I think we can do is, you know, encourage people-to-people exchanges. And we often think about Chinese students coming to this country, but, you know, there’s also this issue of American students going there. And Kurt Campbell announced his 100,000-student initiative, and we’re still nowhere close to that. ORLINS: One of the things that we should do is continue to have, at the top of the list of things—and I’m making a commercial for the New York Times, and the Wall Street Journal, and Bloomberg, and Facebook, and Google, and Twitter—is it should be a priority of the U.S. government to allow China—to force China to open these—to force China to open these. In other words, one of the things that Chinese leadership—when you have these meetings, at the end they always ask: What do you think we can do to help the relationship? At the end of every meeting they say: You know, you’ve been around for forty years. What can you do? And I always say: Unblock the New York Times, Wall Street Journal, Bloomberg, Facebook, Twitter. ORLINS: And that would instantaneously help the relationship. It would instantaneously convey a message that we’re going to be open and we’re going to be part of the international community. And the second thing I say is, don’t deny visas to American academics who write negatively about China. So whenever I’m asking this at the end of the meeting, and the foreign ministry person sits there and he goes: Oh, no. We know what he’s going to say, because he has his talking points. Q: Thank you. John Studzinski from PIMCO. I would like to hear more from the panel about what’s happening within the party domestically. Elizabeth has spoken twice about this is about President Xi and his power. You’ve talked about Belt and Road. I feel very strongly that there’s a lot of fragility in the country right now politically. And I’d like—my question is—and I can’t get an answer from anybody: Why was it necessary at this point, in his second term of office, for President Xi to declare himself lifetime leader? No one, whether your ask K.S. Lee (ph) or the head of the Singapore or Wang Jisi even in Davos was able to answer that question. So I’m hoping one of you, particularly Elizabeth or Steve—will have the answer. Because that—to me, that is the curate’s egg here. Why did he do it now and now at the end of the second term or in other situations? What’s going on that we’re not aware of that is requiring him to take this power at this point in the country? ECONOMY: So I think—look, it’s—the presidency in many respects is the least important of the three positions that he holds, right? The general secretary was for life. The chairman of the Central Military Commission was already for life. The presidency was two terms. What does the presidency allow you to do? It allows you to ratify laws. It is the forward-facing, the outward-facing presence of the country. So when Xi Jinping comes to the United States and meets with President Trump, he meets as the president of the country. So, you know, one could assume that he felt as though he needed all three of those positions, right, to sort of cover the universe of control over policy, right, for beyond two terms. He hasn’t really declared himself leader for life. But he’s—what he has done is given himself the potential to hold office for life, but just hasn’t declared it. And I think he’s three terms and we’ll see where he wants to go. I think he has a lot that he wants to get done, and he doesn’t trust anybody else to be completely on the same page with him to move his agenda forward. So that’s how I understand it. I would just say on the fragility issue, you know, it’s always difficult to know, but I think they are facing—as Steve was talking with the economy—a range of challenges. And I often talk about pockets of discontent, right? So you can see, you know, broad movements—like Minky mentioned—you know, the feminist movement, or the environmental movement. But you also see retired party elders who are very unhappy with Xi’s move, you know, on abolishing the two-term limit. You see liberal intellectuals, entrepreneurs, all of whom are unhappy with the increasing intrusion of the Communist Party into their range of thought and activity. So I think there’s a lot of discontent. Even the birthrate, I think, is a very good signpost, right, the fact that despite having lifted the one-child policy and allowing for two births now, the birthrate is the lowest it’s been since 1961, right? So, I mean, this is extraordinary. And I think that’s an important sign of the overall sense of optimism/pessimism in the country. The first half-hour was really premised on China’s analysis. It was premised on China’s economic strength and it would be growing, except Steve’s premise that, in fact, Xi’s tightening is driving the economy in a negative direction. How does that change your analysis with respect to U.S.-China relations and what Liz just said about the growing discontent, Deng Pufang’s speech, and things like that? RATNER: That’s a good question. I’ll start. I think it’s, I guess, a couple points. One, I don’t think the challenges from China go away if China’s economy starts to stagnate. In fact, it could be—it could be the opposite. And it’s probably—its military is large enough, its economy is large enough that the impact it’s going to have on the world will continue regardless. So I don’t think if there’s a slowing of the economy that it’s—that it’s going to go away. I think it could limit its ability to do some of what it wants to do internationally, but to me it’s not at the core of the problem set. Because, look, you look at a country like Russia now, it can still be an incredibly destabilizing force in international politics. So it obviously matters. And it may affect the mood in Washington in a little bit if there wasn’t as much of a sense of urgency about the Chinese economy, but I still think it’s a—it’s a big enough country and in the future its economy is going to be big enough that the problem’s not going to go away even in a slowdown. I think if there’s a catastrophic economic fail, then we’re in a different place. But a sputtering, slowing economy I don’t think changes the dynamics a huge amount. ORLINS: I think it should remind us that China’s and Xi Jinping’s focus is inward, it’s not outward; that for forty years meetings with Chinese leadership, their focus is always what’s going on internally, not what’s going on externally. The former national security adviser of China told me a great story. He said—this was during the Obama era—he says Obama gets up and he worries about Somalia and Afghanistan and Iraq and all of these places. He says, Xi Jinping gets up and he worries about Chengdu and Ürümqi and Lhasa. It’s a whole different—the threat chart is internal in China, and for America it’s not. And the slowing economy will bring that more into focus. ECONOMY: I like that. The threat chart is internal but the opportunity chart is also external, and he has adopted a much more ambitious and expansive foreign policy. So now Venezuela matters to Xi Jinping as well. I mean, they’re—you know, China is extended in ways that it never has been before. I was talking to a senior Chinese military scholar/official who said they have plans for a hundred bases. Now, that might be an exaggeration, but they are thinking big, right? This is a very different China from the China of the past forty years. Xi Jinping talks all the time about the need for China to lead in the reform of global governance. So I think his—you know, China—Xi Jinping at Davos, China as a leader in globalization, I think, you know, he has—he wants—you know, rejuvenation of the Chinese nation is about reclaiming centrality on the global stage for China. But to your question, Ed—so a little bit of a different perspective, but I like that conception of the internal threat. Anyway, but to your point I would say, you know, I think that the—what’s interesting now is the marriage of technology, security, and politics, right? And so when I think about the challenge that China poses, if you saw something happen in the technology sector that would slow it down significantly, then I think kind of all bets are off. But as long as the technology continues to grow and that sector continues to develop, and you have the political repression and the sort of ideas of expansionism, I think that the challenge still exists, right? Because that marriage means that, you know, China is exporting its surveillance systems, right, and it’s a combination of developments across the security, the economic, and political fields that we will continue to have to deal with. So my analysis would change a little bit, but not entirely if the economy just slows because I think in important ways that technology element is driving things that are pretty transformative globally. KRISTOF: John mentioned fragility and Ed mentioned the Deng Pufang speech that was implicitly critical of Xi Jinping. Should Xi Jinping be looking over his shoulder? I mean, is there a possibility of leadership change that we should be concerned about? RATNER: You know, I’ll jump in on this one. Again, just from the—I mean, Liz has a different, and Steve talking to probably more people on the ground than I am. But I will say that the unclassified conversations that I have with intelligence officials from the United States and elsewhere I always ask them, you know, there’s all these articles in the paper lately about social movements, you know. Is this—should we be making much of this? Every time the answer is no, that the likelihood that we’re going to wake up tomorrow and there’s going to be a coup or he’s really in trouble or he’s really looking over his shoulder, that he is very focused on control as Liz says. He has mechanisms in place. He has been spending his first term consolidating his power. And yeah, we should be looking at these things and maybe he’s adjusting around the edges, but that it’s not accumulating to some brewing storm yet, though. I’d be interested if others have the same view. ECONOMY: I think he’s always looking over his shoulder, and there have been several instances where sort of senior officials who have been arrested on corruption charges have also had tagged onto them something about posing some sort of political challenge to Xi Jinping. Do I anticipate that there’s going to be a coup? No. But if the economy were to slow significantly, if he’s not digging himself out, if he becomes attached to sort of international pressure and a significantly slowing economy, I could see him being pushed to the second line, something like what happened to Mao Zedong after the Great Leap Forward, right? So you know what, dude, you’ve put us too far out there. There was a lot of discussion over the summer about retired party elders saying, you know, he’s succumbed to overreach, right, and causing us all sorts of problems. These are all of his own making, these problems. I don’t think it’s entirely, you know, inconceivable that they would, say, not oust him, but just rein him in a little bit. KRISTOF: Spend more time with his family? ORLINS: But, Nick, clearly, we don’t think there is a significant body that’s going to—you know, is a threat to him. But clearly he does not share that perception, that he—actions that he takes can only be justified in the context of he’s afraid of something. And what I go back to is his childhood, that this is somebody who was born to a vice premier who was living on high and then was thrust out into the countryside. And having had that experience, you can only imagine how that affects his perception of threat today. KRISTOF: In the back there. Q: Matthew Hurlock. I’m a lawyer. My question, I—recently I was speaking with some friends from Hong Kong who surprisingly, they said, you know, the whole South China Sea island-building, et cetera, Xi is declaring himself dictator or president for life. He said they’re—it isn’t really for life. They said his goal—one of his primary goals, consistent with what you were saying about his youth, is to reunify China. And he’s really just—one of his key goals is to get Taiwan back, and this island network is really just to create naval bases, and building his navy is really just to create the bases so that at some point they can surround the island, cut it off, and say: OK, America, do you really want Taiwan? And they think about Ukraine and the non-response to the taking of Crimea, et cetera, and they say—and Xi is building to do that. And my question is twofold. One, what is your perception of the probability of that? And, two, if it does happen, what do you think America’s response is really going to be? Are we going to put down the chips or not? RATNER: I’ll answer the first one. I think the military utility of the islands in the South China Sea vis-à-vis the United States are almost zero, that the American military could destroy those facilities with little trouble. I think they’re largely a mechanism of both administrative control as part of a broader administrative sphere of influence in the region and a coercive tactic against regional countries. But it’s not there to fight a war against the United States. ORLINS: I agree with that. KRISTOF: In Taiwan is there—is there concern about a crisis there? ECONOMY: I think so. This is an area of pretty significant debate within the sort of scholarly analytical community of China watchers. But I think he’s mentioned on any number of occasions the need to reunify, right, and he’s liked that to the great rejuvenation of the Chinese nation. And we’ve seen certainly under Tsai Ing-wen that the mainland has adopted a number of very coercive policies; you know, everything from, you know, again, buying more countries’, you know, diplomatic recognition away from Taiwan; to, you know, calling on multinationals, you know, telling them we’re not going to do business with you if you recognize Taiwan as an independent entity; most recently, I think meddling in the recent local elections in Taiwan; reducing the number of tourists to Taiwan to try to cause them some, you know, economic harm. So I think there’s a definite effort underway to squeeze Taiwan, at the same time as there are some inducements for Taiwanese businesspeople and students. So I think it’s a—it’s a process, and Xi Jinping is pushing forward on that—on that process. I think under Ma Ying-jeou he was more willing to let things go because he felt like Taiwan was moving in the right direction. But under Tsai Ing-wen I think there’s greater concern. So I think he’s moving in that—in that direction step by step. ORLINS: Yeah. I think—and you have to remember, we had eight years of tremendous progress in cross-strait relations under Ma Ying-jeou because he accepted the ’92 consensus on, you know, one China, as opposed to Tsai Ing-wen, who did not. My great hope—and this is somebody who’s worked there for forty-something years because you become an eternal optimist—is that Tsai Ing-wen can be the Richard Nixon of cross-strait relations; that because her base is—would accept any kind of deal that she would make with the mainland, and she will actually make real progress in cross-strait relations. Ma Ying-jeou couldn’t do it because he would be seen as selling out Taiwan. But there is a—just as when I worked on the establishment of diplomatic relations with China and created the American Institute in Taiwan, which is a not-for-profit corporation that effectively conducts diplomatic relations for the United States. So when you use the terminology correctly, you could do the same in cross-strait relations. Extremely difficult politically, however not impossible. Q: Thank you. Rick Niu from C.V. Starr. As a question to the panel, in the prior dialogue you talked about the sentiment of the American business community on U.S.-China relations. I wonder what your views are about the sentiment or the view of the Chinese business community about President Xi’s policy, about President Trump’s policy. Are they actually playing a role to advance a constructive dialogue between the two countries, or not? ECONOMY: Why don’t you do that, Steve? ORLINS: The Chinese business community in the United States has been shocked by what has gone on. The restrictions on investment have really shaken them to the core. And what we’re beginning to see, sadly, is the withdrawal of some of these Chinese businesses from the United States, especially those in the technology area, where the administration is determined to restrict what they can do. And it’s been very, very jarring. And ultimately, in my view, if there’s a national security concern, obviously we should be doing something. But where there’s no national security concern, to be restricting Chinese investment in the United States has a consequence for the value of all American investment; that when there are two bidders for something—Byron (sp), I hope you’re not looking confused on this one—(laughs)—when there are two bidders for something and we disallow one of the bidders, it means a lower bidder is very likely to get the asset. And when we—government intrudes in the process that way, that devalues all assets in the United States. And it’s bad. Q: Robyn Meredith, author of The Elephant and the Dragon. We’ve talked about so many important bilateral issues here, but it seems to me the one thing that allows Trump to have traction with his own supporters, who are often hurt in the short term financially by his policies, is that this debate is really a debate about the impact of globalization. And I wanted to go back to what we began with early in this conversation about what the U.S. response ought to be, because forty years after China started embracing the West and globalization there has been an impact on developed country incomes. We’ve seen middle-class incomes in the U.S. come down partly as a result of globalization, just as we’ve seen hundreds of millions of people lifted out of poverty in China, obviously a good thing. So can we—now we’re seeing globalization sort of torn apart. That’s what we’ve—as a business community and as workers have accepted for the last forty years. What should the U.S. be doing to better compete in a world in which China has moved up the value chain, and our clothes as well as our iPhones are made there? RATNER: Sure, I mean, I’ll talk—I’ll jump in. I guess there’s a—there’s a hundred ways to answer that question. I’ll answer from a political perspective. I think as a—as a Democrat, I think the question is: Can the United States—can the Democratic Party, can the United States come up with a strategy that is politically feasible that is able to identify the necessary policies to deal with China’s unfair and illegal trade practices of cyber espionage and joint ventures, et cetera, et cetera, et cetera, that’s in the—but at the same time keep an open door to high-standard, multilateral trade agreements? So can we think about adopting some of the approaches of the Trump administration, not the expansive tariffs, but then go ahead with a more traditional free-trade set of policies, multilateral approach, with then domestic policies to support those who need that kind of support with trade assistance? I think that’s the needle you want to thread. I think the problem is that the—politically it’s going to be easier to just throw this all together and come out against free trade and blame that as a carte blanche. So that will be the trick for me that I’ll be looking for in the next couple years politically, to see if folks can separate those with nuance, if Nick’s looking for it. ORLINS: But we clearly have once again exaggerated the narrative, that people say the jobs have gone to China. I think the administration claims six million jobs went to China. We lost six million manufacturing jobs in total, and that means zero went to automation, zero went to technology, zero went to Mexico, zero went to Canada; they all went to China. Oh, come on! It’s just—it’s another example of where there has not been the pushback that there should have been on this narrative that exaggerates China’s role. KRISTOF: Can I—so, I mean, I come from a blue-collar area in Oregon that was—David Autor at MIT has looked at Chinese—penetration of Chinese goods by area, and has found that those areas that had greater increase in—had higher prime-age male unemployment, more family breakdown, more child neglect a year later. And that’s very much reflected in my own community. On Saturday I was at a funeral of a 57-year-old buddy of mine in Oregon who self-medicated with meth, and this is very much the story of my area and a lot of blue-collar areas around the country. But I do think that the—and I think that a lot of America underappreciated how devastating the impact was on blue-collar workers. But I also think that the response is fundamentally one of social services. You look at Windsor in Canada, and Windsor lost workers, as Detroit did. Windsor workers were so much better off than Detroit workers were. And so we see this through the prism of trade, but it’s also very important to see it through the prism of social services, economic training, and so on. Plus, there is, as Steve says, this wild exaggeration about scale.